Anatom (1752–1832). Autograph letter signed. Pavia. 1 S. auf Doppelblatt. 4to. Mit eh. Adresse (Faltbrief). 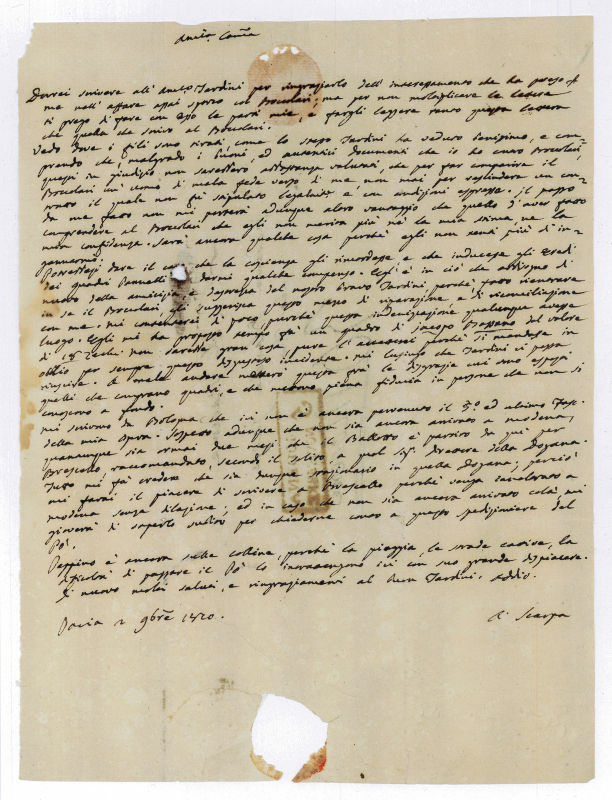 Lengthy letter to the Representative of the French Republic in recently occupied Pavia, who was then acting as Governors of the City. Scarpa argues that he “as every good citizen should do” has agreed to pay the new military tax of 600 lire imposed by the French, and says that for the past two months he has not received a monthly 77 lire he is entitled as Director of Surgery in the Medical School, while three of his colleagues in the same situation as his are still getting their monthly payments. 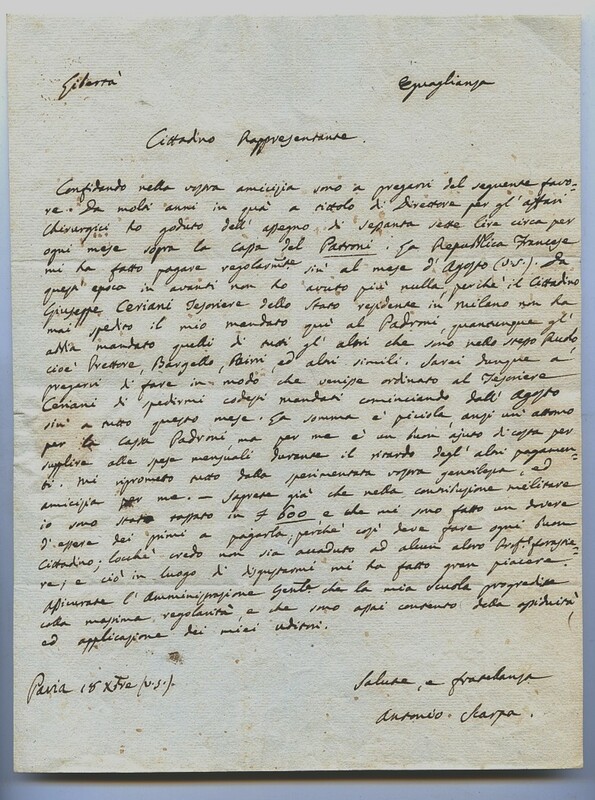 He attributes the mistake to the fact that treasurer Giuseppe Ceriani, who is based in distant Milan, has not yet signed the necessary papers for his payment and trusts that his correspondent, Ceriani’s superior, will remind him of this injustice. After payments are resumed Scarpa says he will be better able to maintain the regularity of this classes at the Medical School, where he confirm the students have been showing great zeal and assiduity. Intersecting folds, some wrinkling, and scattered soiling, otherwise fine condition. 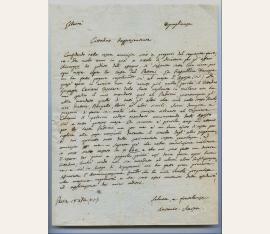 An interesting letter at the time Napoleon had invaded the north of Italy in the name of the French Republic..
Italian anatomist (1752-1832). 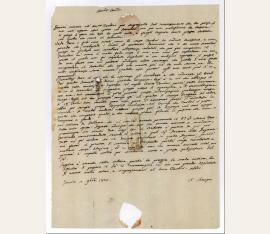 Autograph letter signed ("A. Scarpa"). Pavia. Large 4to. ¾ p. Together with a lithographic portrait. To an unnamed female recipient, talking about the printing of one of his works and the problems of buying paintings: "'il bravo Tardini […] mi ha proposto tempo fa un quadro di Jacopo Bassano del valore di 18 zecchini […] A male andare metterò questa frà le disgrazie cui sono [avvezzi?] quelli che comprano quadri, e che mettono piena fiducia in persone che non si conoscono a fondo". - Somewhat spotty, edges slightly frayed; small loss to paper in the lower section (not touching text).